Since the Dutch health care reform in 2006 hospitals are struggling with their dependency towards health plan organizations. 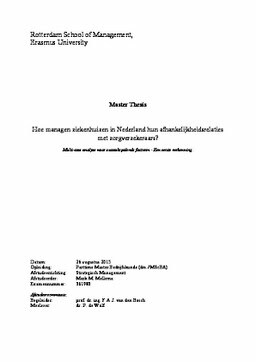 From a Resource Dependence perspective, this thesis aims to provide more insight in how Dutch hospitals manage their dependencies towards health plans and tries to identify factors that contribute to the success of interventions by hospitals regarding this interdependent relationship. Although a lot of research has been published on how organizations should manage their external environment and on the various types of interventions an organization could initiate to influence an interdependent relationship, little has been written in Resource Dependence literature about the various factors that contribute to the likelihood of a desirable outcome of an intervention. This thesis describes seven case studies of different hospitals that used interventions in order to influence their interdependence relationship with health plans, followed by a cross-case analysis. From the analysis, a distinct pattern between successful and non-successful cases seems to emerge. Based on these patterns, factors are identified that potentially contribute to the likelihood of intervention success. This has resulted in the two conceptual frameworks as presented on page 84. None of the factors identified could be isolated as solely responsible for the result of an intervention, indicating a complementarity effect. Among these factors, two factors were identified as conditional to the success of an intervention: 1. the financial fitness of the hospital initiating the intervention, 2. the degree to which the hospital uses the counterparty’s interests as part of the intervention design.